Are you yearning for something special to fill the empty walls in your home, but struggling to figure out where to start? Even just a quick scroll down this page will blow your mind, with photo wall ideas to suit many tastes, budgets and lifestyles. Style isn't an easy thing to master, but any of these ideas will soon see your home transform from glib to glorious, all with just the click of a button. Which prints (or three) will you be bringing home? Photographic art looks sensational mounted on a split image canvas. Try it once and there'll be no turning back. 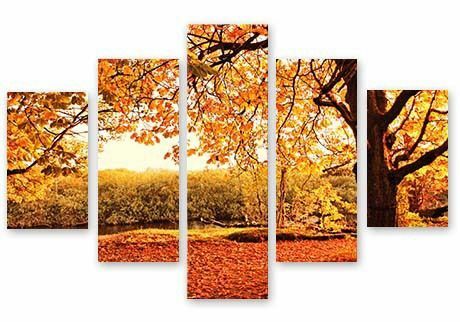 Nature photography, like this amazing Autumn forest print, will add warmth and style to your home. The trick is to complement the colors featured in a photo to the coloors that decorate your room - the walls, rugs, cushions and furniture. Browse our Nature Art collection in our Canvas Art library and you'll be sure to find something beautiful to suit your decor. A glass wall display featuring maritime imagery will give a room a fresh, active atmosphere, inspiring get up and go each and every day. Nautical style is back and she's as stunning as ever. 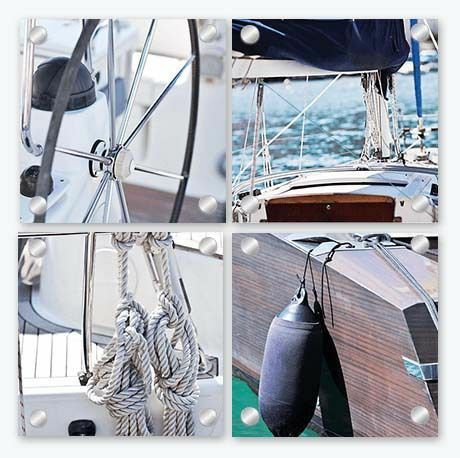 But watch out, this 2 x 2 panel print, featuring stunning sailing shots, is designed to seduce. Printed on glass, this wall display is begging to be mounted in a family room or office, ready to inspire the next sailor who passes. Whether you're an avid sailor or an aspiring crewman, this interior art piece will help you keep calm and sail on. Use your own marine photos or access some from our Canvas Art library which features over 25 million images. To give an upmarket feel to your baby photos, opt for a metal monochrome print. Transform everyday photos into high art with this edgy, three panel black and white photo display. Strip the color away, forcing the eye to focus on the detail - the love, care and warmth between mother and child. Get carried away by the whimsical world of the Geisha, with a stunning display of Japanese wall art. While the history of the glamorous Geisha is dotted with struggle and controversy, the modern Geisha is considered the epitome of femininity. 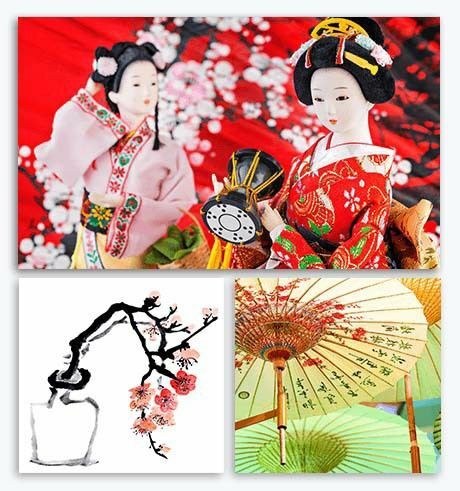 That is why Japanese art, with its Geishas, cherry blossoms, hair pins and umbrellas is a fantastical way to add a womanly touch to a room. A wall display like this is ideal for a woman's retreat, yoga room, reading room or sewing room. To create a space that's all your own, browse the Japanese Art collection in the Canvas Art library. Alternatively, search for 'geisha' or 'pink' or 'umbrellas' to find other works of art that may appeal. He will have a hard time averting his gaze from a phenomenal wall display of architectural delights. Photo walls are ideal for the home or workplace office as they give you the opportunity to choose a theme you love and run with it. This 3 x 3 wall display is an example of what can be achieved with very little effort. 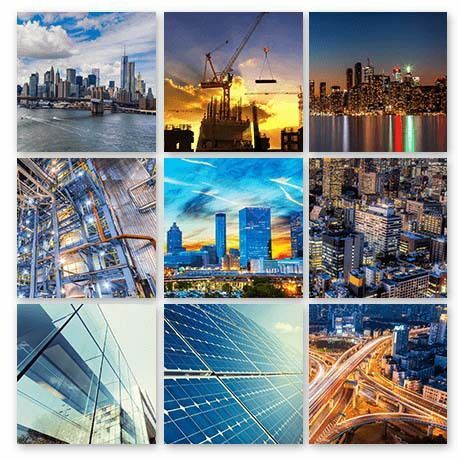 All you have to do is find the artwork - think commercial buildings as well as historical, industrial, modern and infrastructure architecture. Free image sites like Unsplash have sensational architectural and streetscape art photography. 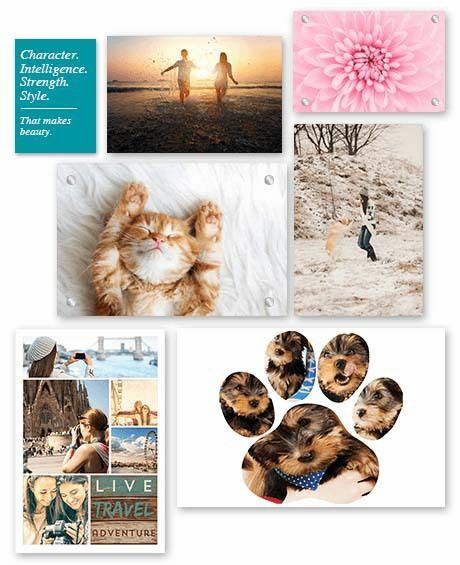 If you find yourself getting stuck, browse our Canvas Art Gallery, screen grab the images you like and we'll have a go at creating the wall display for you. Alternatively, you can purchase this print exactly as is! To find out more contact . With the advent of affordable canvas, family portraits are so much more appealing than those of yesteryear. Say goodbye to the family photo taken in a studio with a daggy backdrop, fake smiles and silly toys to keep the kids entertained. Photographers today are taking families out and about to create a series of lifestyle photos that are ideal for photo walls. The wonderful thing about leaving a room is that the family is more relaxed, giving the photographer the opportunity to capture more genuine smiles, more natural poses and a more 'real' representation of who your family is and how you interact. Sure, you still all have to be well dressed, but the right photographer will give you all the tips your family needs to show up looking dapper. 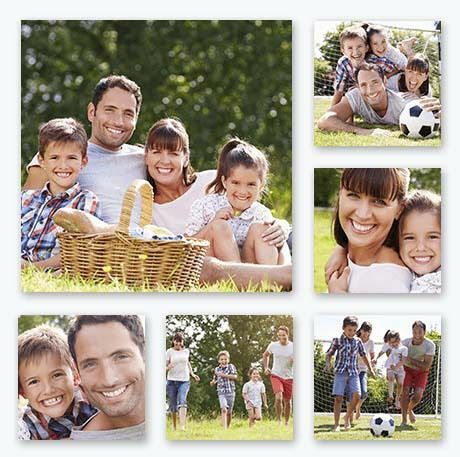 This canvas wall display, featuring six panels, has one panel larger than the rest - perfect for a 'whole of family' picture. 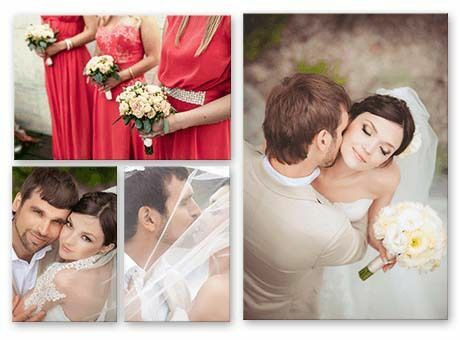 Funk up your wedding photos by printing onto luxury metal, a wonderful way to spruce up a hallway. Regardless of whether your wedding was traditional or a little offbeat, printing to brushed aluminum adds a sense of extravagance. Ideal for modern styled homes, metal as a material is not only robust, but has a special sheen that is so superb it has to be seen to be truly appreciated. Once you discover metal, it's hard to turn back but it's OK to save it for those more special occasions, weddings being the perfect example. When organising your family portraits, don't forget to include your furry, four legged friends - a wonderful way to make them officially part of the family. 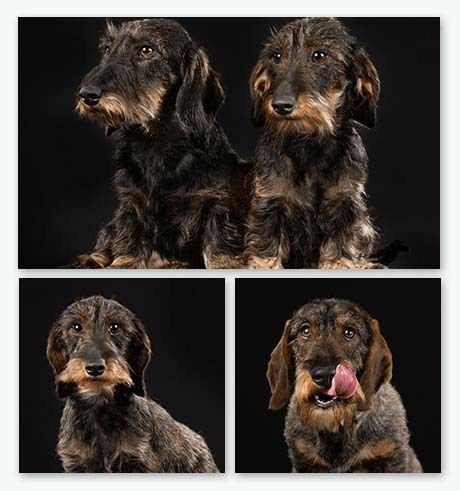 Get ready for 'Ooohs' and 'Ahhhs' from visitors when they see your stunning pet portrait. Kids and adults alike will love the new level of attention given to the more furry members of the family. Take some shots yourself or commission a professional photographer to take some pet portraits for you. 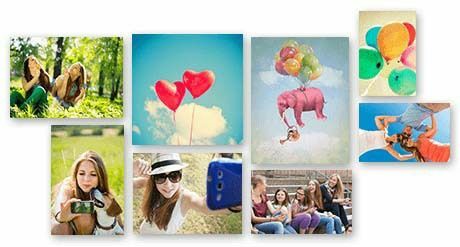 Once you have the digital images, upload them into our CanvasApp and create a canvas photo wall that will make you smile every time you pass. The impact of a black backdrop is stunning for lighter colored dogs, but not so great for black or dark brown breeds who will stand out better on a lighter backdrop. Teenagers love being daringly different, so embrace the wild and wacky with a collection of single canvas prints. This isn't just any old wall display, this photo wall features single canvases in all different shapes and sizes. There is some method to the madness of course, but to make this idea work, you need to create multiple 'single print' canvases using our CanvasApp. Make over a dull corner of a home or workplace with an inspiration wall that will stop everyone in their tracks. Put your sunglasses on because we've turned up the brightness on this wall display, with fresh, fun citris colors that will dazzle even the most cynical onlooker. 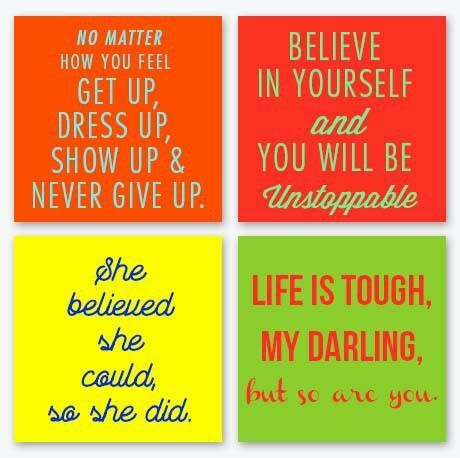 A great addition to a home or office kitchen, you can personalize your own print with any quote you like. Simply visit Canva and design four different square prints using all the beautiful tools. We recommend choosing the high resolution 'Album Cover' design then downloading it as 'PDF: To Print'. All you have to do then is convert it to a JPEG and upload it onto this 2 x 2 wall display using Canvas Factory's CanvasApp. Bring your living area to life by building a photo wall full of texture, color and organized chaos. We're not suggesting you buy all these at once, but rather begin building a collection of single prints in different materials - canvas, glass and metal - and in different sizes and shapes. Pick a different subject everytime - people, pets, plants, travel, inspirational quotes. You might even like to print your Facebook cover photo rather than leaving it live in the land of digital. Perhaps consider each canvas as a reward. That is, everytime you achieve a mini goal, treat yourself to a new print. Perhaps you got top marks for an assignment, lost 5kg, beat your running personal best. Grow your photo wall organically and see it expand into something bigger and better each and every time. You deserve it, don't you think?